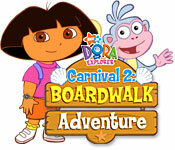 Doras Carnival 2: At the Boardwalk PC Game Download Only $0.99! (reg $10) + 70% Off All Other Games! For a limited time, you can get the Doras Carnival 2: At the Boardwalk PC Game Download for only $0.99! To get this price, use the code BOARDWALK99 at checkout. (code valid for new customers only) Click on the green "Buy Now" button and then you'll be able to enter the code. If you're not interested in this game and are a new customer, use the code NEW299 to save 70% on any and all other games on the site! This makes $9.99 games only $2.99.